Is there an auspicious time for blessing a newborn babe? Wondering what color candles to use for a winter handfasting? Are there times when it can be dangerous to work magick? What herbs are best to use when the Moon is in Cancer? Magick is intent, but any witch will tell you that intent requires forethought and preparation. And even the most seasoned ritualist needs a reference to determine the best timing and most powerful ingredients for their magical work. From Saturday to Scorpio to September, from Vervain to Mandrake to Amber, using the right magickal correspondences strengthens any spell, ceremony, or ritual. 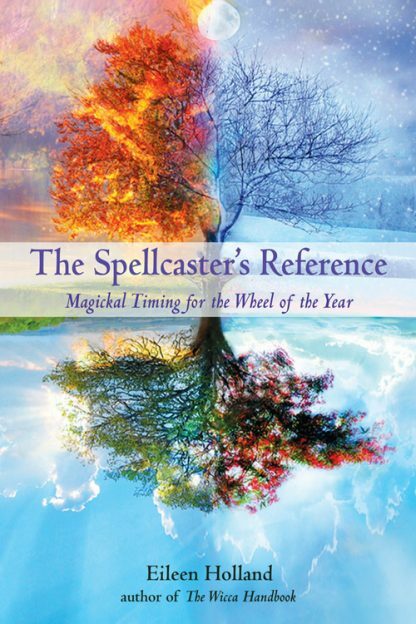 Here Eileen Holland has gathered together a wealth of magickal knowledge, complete with everything from hours, days, weeks, and astrological alignment to proper corresponding plants, animals, oils, herbs, and deities, and compiled them into the ultimate reference book for anyone seeking guidance in creating and timing their own enchantments. Includes a glossary of less familiar terms and deities, as well as a glossary of ingredients. When Wiccans speak of the Wheel of the Year we generally mean the solar cycle, the Earth's annual voyage around the Sun, and the eight sabbats with which we celebrate that. The year is actually composed of many interlocking wheels though. Those who practice magick would do well to learn and remember this. All of these cycles influence the natural world, and we can use them to enhance our magick and rituals. * A complete manual for anyone who casts spells or performs rituals, and for every witch at any stage of their practice. * Eileen Holland's The Wicca Handbook continues to bring new generations of witches an accessible treasury of Wicca 101.